This time, your gift will top all others. A gorgeous, lovingly handcrafted piece of jewelry art simply cannot be topped. Jewelry gifts remain the most sentimentally loved gifts, ones that are kept and remembered for a lifetime. Best Gift Ever? A Krikawa Gift Certificate! The Perfect Way to Say, I love you. Jazz up your classic design at Krikawa! With a unique stone the color of the ocean where you met, or perhaps a personal symbol hidden inside the piece, you can create jewelry that is more than meets the eye. Give a gift that really says I love you. Your love is worth more than a mass-produced, off the shelf stock item. Have it made to order at Krikawa. In a rush? View all Ready to Ship Jewelry Gifts Here. Swirled mokume gane makes the very finest anniversary gift. Me plus you equals us; mokume gane is the ultimate married metal. Choose from a collection of fine jewelry that Krikawa goldsmiths have already made. Your special piece will be handcrafted with the metal and stones of your choice. Looking to impress with something extra special? 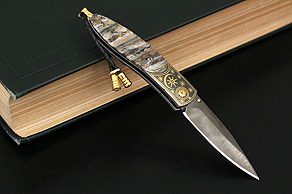 Feast your eyes on unusual materials like Damascus steel and fossilized mammoth tooth! 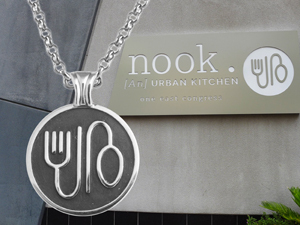 We've made pendants, pins and medals for philanthropic causes, schools, and large companies. Send us your logo or ideas, and we will make it a reality.